The Sardana is a traditional dance of Catalonia. The dancer is called a sardanista. It is a slow dance with intricate steps, danced in circles of differing sizes with a small band providing the musical accompaniment. Dancers hold hands with raised arms and follow a leader who leads the movements and timing. 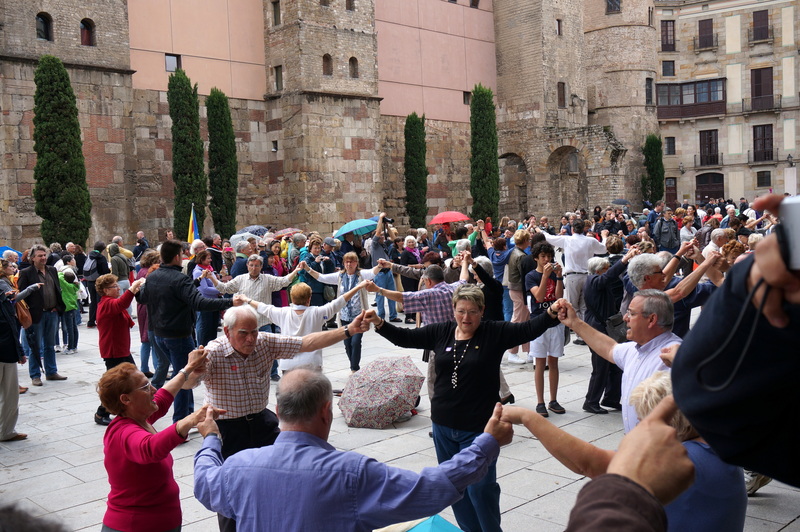 When danced in the streets and squares of Catalonia, passers by often stop to join in and circle sizes fluctuate. The dancers are made up of alternate men and women, and care must be taken by those joining not to split partners. The dance’s origins are not entirely clear but it is known that it was popular in the Empordà region in northern Catalonia by the end of the 19th century. The Franco dictatorship that lasted from the end of the Spanish Civil War in 1939 to Franco’s death in 1975, heavily promoted nationalism and banned regional languages, such as Catalan, and local traditions. The Sardana, which was seen to embody Catalan heritage, was amongst the traditions banned. Since 1975 it has become ever more popular, symbolising as it does, Catalan nationalism. In 2010, the Generalitat de Catalunya added the sardana to the Catàleg del Patrimoni Festiu de Catalunya (catalonia’s festivities heritage catalogue) and declared it a festivity of national interest. Its importance in Catalan heritage can be seen in its regular depiction in public art installations, including murals and sculptures. 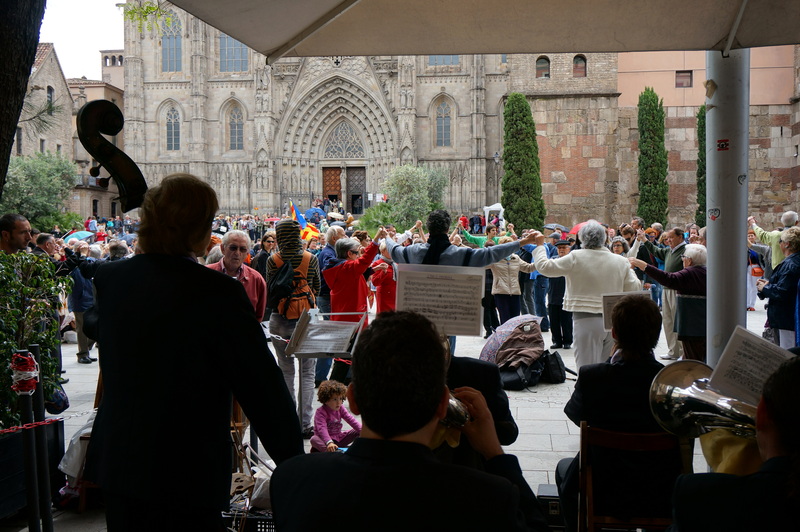 Music for the sardana is played by a cobla, a band consisting of 10 wind instruments, double bass and a tamborí (very small drum) played by 11 musicians. The cobla has five woodwind instruments: the flabiol which is a small fipple flute, and the tenora and tible (two of each) which belong to the oboe family. These and the tamborí are typical Catalan instruments. The brass instruments include: two trumpets, two fiscorns (a type of saxhorn created by Adolph Sax during the 19th century), and a trombone (usually a valve trombone). The double bass was traditionally a three-stringed one, but now the part is usually written for and played on the modern (four-stringed) instrument. The music is usually in two sections (tirades), called curts and llargs, each of which may be repeated in various ways to form the pattern for the complete dance. The dance tempo is usually a steady metronome beat of about 112, in a 2/4 and/or 6/8 rhythm. In order to dance sardanes comfortably the footwear must be flexible enough to allow the dancer to jump slightly when the largs come. Traditionally sardanistes wear special dancing shoes called espardenyes made of esparto grass fabric and with two long fabric strips to tie them up around the ankle, though these are now often replaced with a modern version or simply trainers. 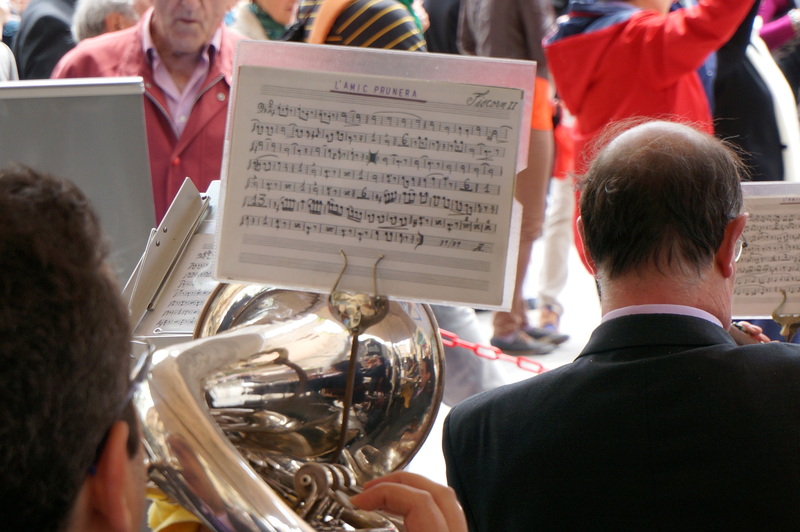 During the summer, you’ll see sardanas taking place in many Catalan towns. In Barcelona, you can normally watch the spectacle in front of the Cathedral on a Saturday evening or in Plaza Jaume I on a Sunday evening. Posted as part of Tagged D, ABC Wednesday and Alphabe Thursday. Why not go along and enjoy the 30th anniversary Sardana Dance Festival at Tossa de Mar on Sunday 8th October 2017. It is a wonderfully happy annual occasion. That sounds great. I am very tempted! I love when I learn something new here! This delightful dance is beautiful! Apologies, your comment got trapped by the spam filter- but it’s here at last. Thank you so much for visiting. Such an interesing post. I`ve never heard before of sardana. If I didn’t have two left feet, I’d try this! Enjoyed reading the backstory for your “Dance” submission to the Photo Roulette! Thanks for the education. Loved the close-up of the footwear too! A very interesting post. I love the mural and I love how all young and old take part. Great pics. Dropping by from the ABC Wed prompt. Dancing is so much fun and a nice social activity !! Can sense it in that mural too!! What a great sense of community! This comment shows me how important it is to show the traditions and historical events of our countries all over the world. This way we learn to understand each other. Thanks for the beautiful post. I missed this when I was in Spain. It’s a great reason to return — love seeing people dance. What a delighful post. I would have loved to experience this dance event. What a beuatiful tradition. Too bad I missed it when I was in Barcelona. I was there wrong days i guess. Love your photos. It captured the spirit of the festival. I love dances from other places. I have been a folk dancer since my college days. It looks like so much fun! Thanks for the visit. I am away for a couple of weeks but I will come to visit your blog once I am back and organised again. thank you for this wonderful dance report!